My goal as a guide is to passively and patiently observe a subject of nature until you become a part of the experience and not just a spectator. It is a privilege to be out there. Ground Pangolins are secretive and nocturnal and will spend most of their evenings digging shallow scrapes out of the ground for ants and occasionally termites. Martial Eagles will often hunt from the wing, soaring high and able to spot prey up to 6km away, they will even take on small antelope. Mixed herds of different herbivores will often result due to animals having the same diet, or to feel safer in large numbers. As their name suggests, this Violet Dropwing perches with wings downward and forward from which it forays for prey. Male lions spend long hours away from their pride in order to patrol their territory, sometimes together in coalitions and sometimes they go at it alone. Black Mambas are notoriously aggressive, however most of the time they will choose to escape. This specimen raises its hood in a sign of aggression. Liam Rainier grew up in bustling Pretoria, South Africa, where his family found every opportunity to get away from the city and explore nature. Consequently, Liam’s love for the wilderness was instilled in him at an early age—his father’s own adoration of nature fueled a steady exposure to new landscapes and exciting wildlife. 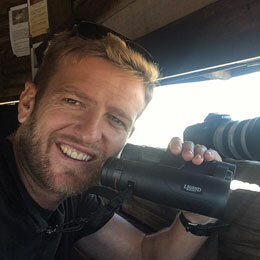 After earning his Bachelor of Science degree from the University of Pretoria, Liam followed his life-long passion for exploring the natural world. He has spent the last decade as a naturalist guide in the bushveld—the sub-tropical woodland ecoregion of Southern Africa—a landscape Liam knows intimately. He loves nothing more than to share his knowledge and passion for animals and their behavior. His excitement and pure joy of experiencing wildlife sightings, big or small, is contagious. Liam has a deep love for walking in any natural environment, whether he’s expertly tracking a leopard in the bushveld, silently trailing a breeding herd of elephants, or intently listening to bird calls in a forest canopy—nothing enraptures the senses more. Liam’s knowledge of and passion for the flora and fauna of the area was incredibly infectious and made each drive even more memorable—he even found time to give us helpful photography tips! We really can’t express how impressed we were with him. Fabled history and majestic scenery on the “Rooftop of Africa” combines with fascinating wildlife and jaw-dropping tribal culture for this comprehensive exploration. The great migration is a spectacle to behold, but to witness it first-hand from the finest tented camps, set in the heart of the action, is unbeatable! An insider’s guide to the best South Africa has to offer: dramatic scenery, outstanding wildlife, endemic flora, and fascinating cultural history. Legendary wilderness and astounding diversity in less-traveled southern Tanzania, plus Chimpanzee-tracking in Mahale Mountains. Ask Liam a question about his upcoming expeditions? The ability to adapt to different environments is what determines survival. You may come across animals of the same species, but their behavior in contrasting habitats may differ entirely, due to factors such as food supply and competition. When going on safari in different regions, it is important to keep this in mind. You may encounter some of the same animals you’ve seen before, but pay close attention. They may behave quite different than what you’d expect. Never miss an update! Subscribe today and be the first to know about new adventures.